Willow Tree is an intimate line of figurative sculptures representing sentiments of love, closeness, healing, courage, hope...all the emotions we encounter in life. Artist Susan Lordi hand carves the original of each Willow Tree sculpture. Pieces are cast in resin from her original carvings, and then individually painted by hand with lead-free paint. "I try to keep the interpretation of Willow Tree open. I hope this makes it more personal, and allows the viewer to decide its meaning." - Susan Lordi. 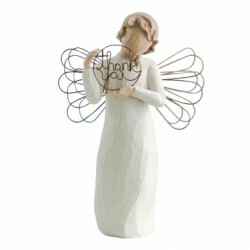 Supplied in a branded gift box and a gift tag with sentiment 'With sincere thanks'. Not a toy or children's product. Intended for adults only.